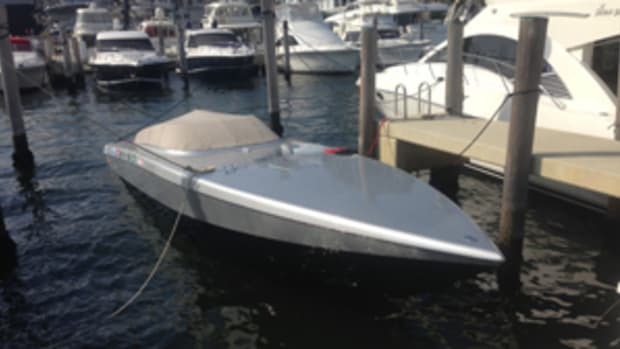 When you think of boating in Florida, images of a "Miami Vice" go-fast blasting through Government Cut might come to mind. Or you might envision big convertible sportfishermen or powerful center consoles with two, three or four outboards. Boating is all about fun and flash in Florida, but SeaVee has been pushing the technology envelope to take boating and fishing to the next level. For example, SeaVee was the first to use single-pod propulsion ? a ZF Marine pod drive with joystick and a ZF bow thruster ? in a recreational boat, its 34-foot center console. Click play to watch SeaVee boats in action. Ariel Pared, Ralph Torres and Moises Rodriguez head SeaVee Boats. "They&apos;re young guys and not afraid of being aggressive," says naval architect Robert Kaidy, of Ocean5 Naval Architects, the company that carries out SeaVee&apos;s design and engineering ideas. "A more conservative company might not do the things these guys are willing to do."